Explore, Learn, Have Fun! : How to improve your oral health with OraMd! 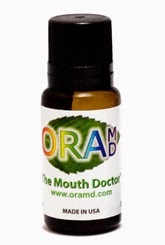 How to improve your oral health with OraMd! Fast forward to the next week ~ I got an email asking if I'd like to try an all-natural, liquid toothpaste/mouthwash/breath freshener. OraMD is a Sodium Lauryl Sulfate-free, Fluoride-free productm comprised of 100% pure botanical oils ~ almond, spearmint and peppermint. Since I was looking for something exactly like this product, you know I agreed to try it out and share it here with y'all! When it arrived, I didn't get started on it right away, as this summer has been crazy. Finally things calmed down around the beginning of July, and I started using OraMD consistently. The flavor is a little different, it was odd/strong tasting, at first. It even burned a bit. But I kept using it and I'm so glad I did! I noticed with the first use how clean my teeth felt! We are talking walking out of the dentist office clean! And it's only gotten better with time! I use Sensodyne (still trying to use it all up, lol) in the morning, and OraMD at mid-day and bedtime. Each bottle has 400 drops - so it will last you for a while! Now that I have used it for about a month, I really enjoy the flavor - it is a true mint flavor, from the botanical spearmint & peppermint oils. And the best part is that my mouth is doing much better now that I've eliminated the SLS out of my oral hygiene routine! OraMD is something I really love! I don't use much at all when I brush, just a couple drops, so I still have a good bit left in my little glass bottle. David has tried it too - he didn't love the flavor at first, but he got used to it, too. When I order more, he will get his own bottle! I find it so amazing that this little bottle of OraMD takes the place of three products! Use a few drops on your toothbrush for brushing. Add a few drops to water to use as mouthwash, and apply a few drops to your tongue as a breath freshener! Love multi-purpose products like this - saves me money, time and counter space, lol! Not to mention you are not having to buy three products when you shop! And you don't even have to leave the house to get OraMD! And the fact that it is pure and natural makes me feel happy! This is a product I feel good about my family using! an ounce of water, swish and gargle. tongue to coat the gum line and teeth to kill bacteria and keep breath fresh. · New research study conducted at the Center for Oral Health Research at the University of Kentucky in Lexington, KY shows OraMD ingredients to have effective antibacterial activity against Gram positive and Gram negative oral bacteria. This suggests that the beneficial clinical effects in reducing periodontal inflammation may be due to the antibacterial effects of the oils. · Main office customer service available 8:30am – 9:00pm EST (-5:00GMT), Monday-Thursday; 8:30am-5:00pm EST (-5:00GMT), Friday. SPECIAL OFFER: The manufacturer is willing to offer ALL of my readers one FREE bottle! They would love to have you try out OraMD ~ they will send you one free bottle if you pay a nominal ($5.97) shipping/handling fee. You will also get two eye-opening reports: "The Six Hidden Dangers in Toothpaste", and "Why the FDA Requires a Warning Label on Your Toothpaste" The total value is over $40! Click here to get your FREE bottle and FREE reports now! Want to try it free? The manufacturer wants to send THREE of my readers a FREE bottle of OraMD to try!! Enter through my rafflecopter widget below for your chance to win!! Good luck, y'all! Disclaimer: I was provided one bottle for my personal use for this review, and the sponsor will provide the three bottles for my winners. No other compensation was received! All opinions, as always, are my own! I like how OraMD uses only pure ingredients. No GMOs - that is a huge plus for me - after reading about the effects - they scare the daylights out of me! I've never used oramd, but I love that it is made in the us!! There's no scary side effects because pure ingredients are used!